« Last Of The Raspberries. I hope you don’t get horse chestnut blight up there. It’s affecting our horse chestnut, planted some 30 years ago. Someone mentioned it the other day, but I think it was when I was in England. There are still elm trees here. I hope I got it right, maths is not my best subject. (Somewhere on the web there exists a page with Norwegian kroner into Argentinian pesos, but I’m not sure where). Any chance you’d go out and try the avenue shot again? I’d love to see it without the blurrrrr. 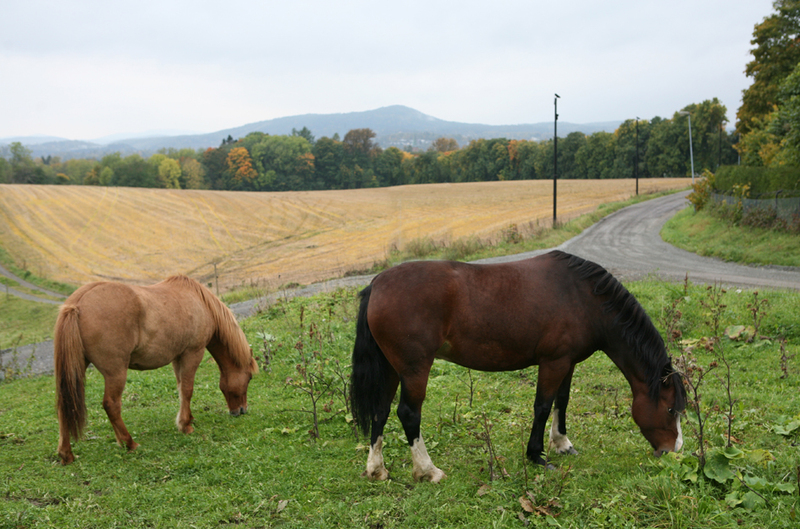 The horses look properly enthusiastic about October. The trees on our street just started turning color last week. One early maple is papering the sidewalk with pink leaves. The common name horse-chestnut is reported as having originated from the erroneous belief that the tree was a kind of chestnut, together with the observation that eating them cured horses of chest complaints. 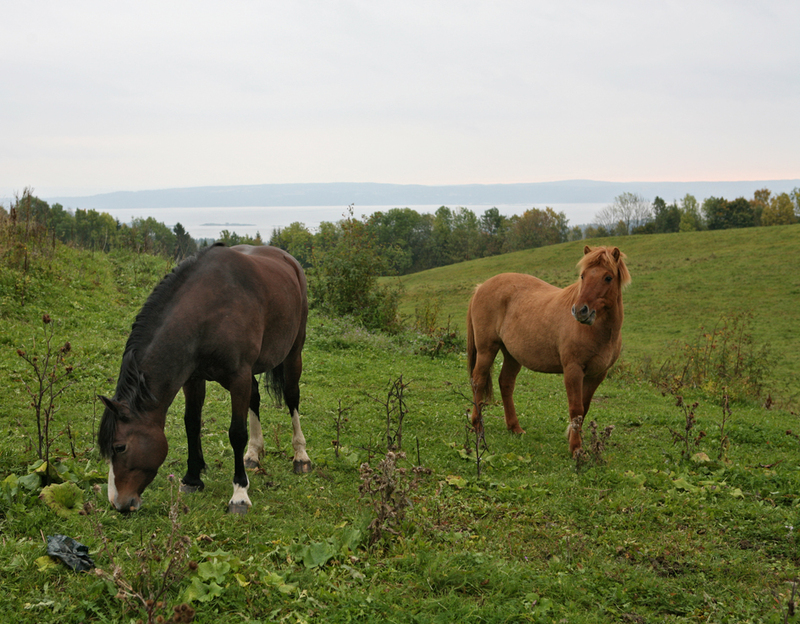 How does a horse file a chest complaint? Anyway, this has to be the other way around. The folk-etymological reinterpretation of the name as chestnut, together with the derogative animal reference (see e.g. 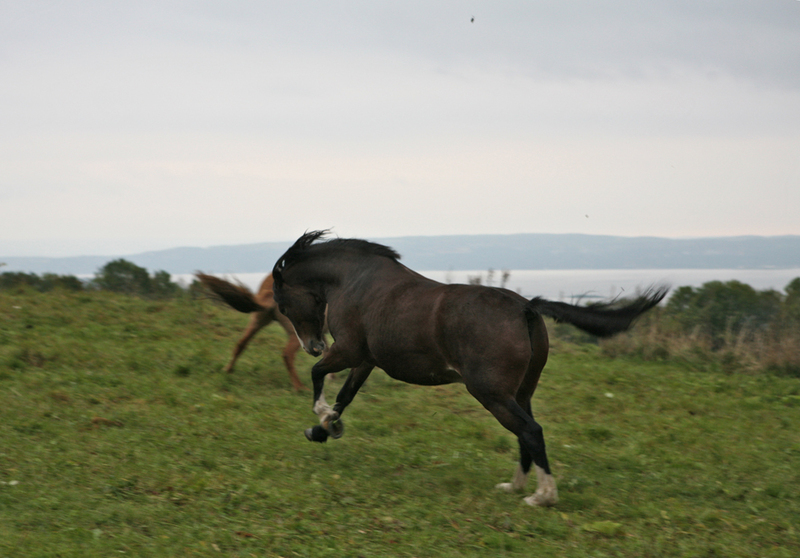 ‘cow parsley’ and geitrams), gave the idea that it cures horses from chest complaints. Just type “180 norwegian kroner to argentine pesos” into Google. How odd, you’d think the Greeks would know what they meant when they spoke Greek, without having to think about it. But the editors of the dictionary entry are at fault. “… thought was derived from …” would have made more sense than “… thought meant …”. Who edits the editors ? In German it’s called Rosskastanie, using the old-fashioned upper-class word for horse. Round here, everybody believes that you should keep one in your pocket to ward off rhumatism. October – month of Cox’s Orange Pippins. Yum, if I may say so, yum. bruessel, it’s upper-class only to some extent in Germany, and apparently not at all in Austria and Switzerland. I just know that I’ve heard Roß used in the Rheinland in the sense of “nag”. Yesterday we drove by an Animal Shelter that had half a dozen goats grazing in a pasture. I’ve just googled it – I hadn’t realised that you could get goats for “re-homing”. Hm. But it would be cruel to keep a goat on its own, would it? MMcM: Just type “180 norwegian kroner to argentine pesos” into Google. I’ll have to remember that. It doesn’t work if you’ve still got the quotes round it when you do it. Dearie: But it would be cruel to keep a goat on its own, would it? Well, I haven’t asked, but I think so; not cruel exactly, but how would you like to be the only human in a roomful of goats, your whole life? Anyway, two goats can live as cheaply as one; just get two! I’ve never heard that Ross, maybe they don’t use it around Hamburg? Is Wabe cognate with “web”? 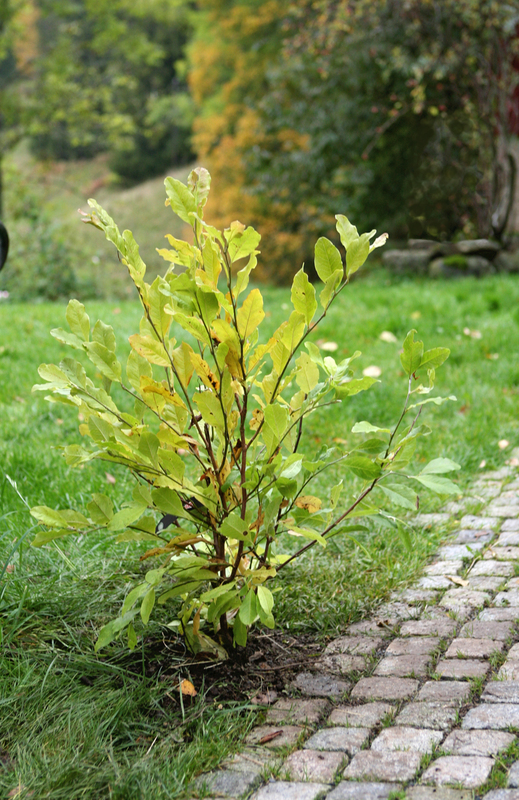 Ø, I agree, I’d like a straight answer about where Castanea comes from. 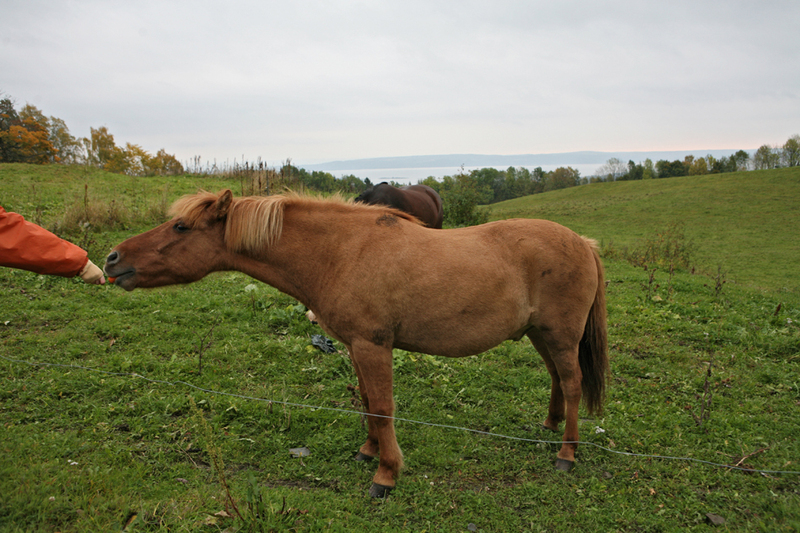 Trond: How does a horse file a chest complaint? Agreed, Wikipedia isn’t perfect, but most of the time I’m very glad it’s there. And anyone who’s too snotty to utilise it is a fool (I don’t mean you, obviously). 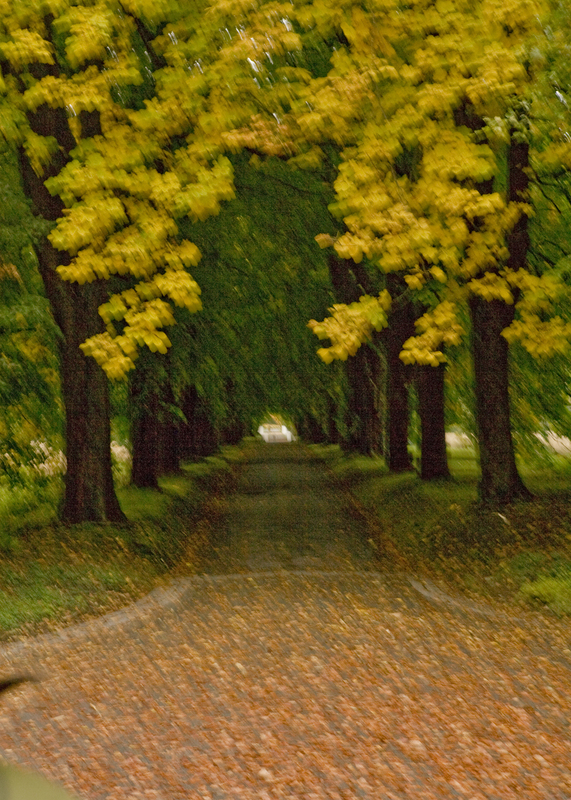 The chestnut alley reminds me of similar French landscapes at this time of year. When I was young October st was the start of the school year and pretty soon we were wading through a litter of leaves, kicking them up as we walked to school. 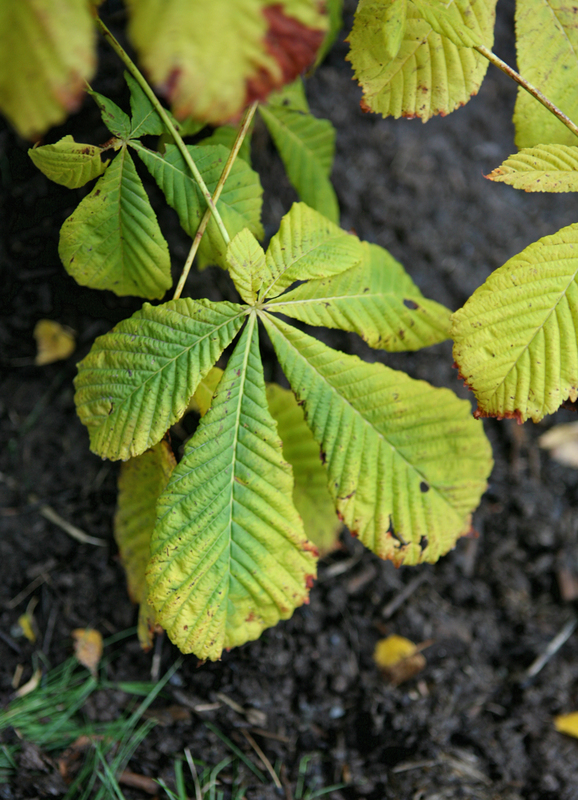 Around age ten I planted a horse chestnut in our minuscule garden. It grew steadily into a tree, apparently doubling in height every year. 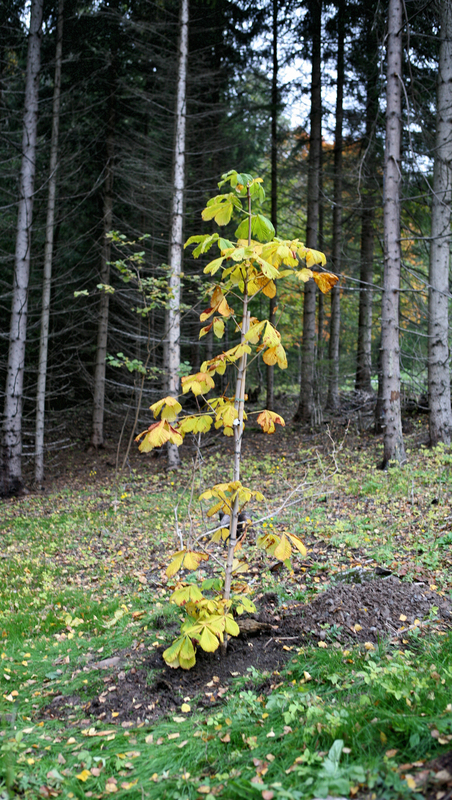 Several years later it was starting to get too big for the space and my father had it removed – not cut down – and installed in the much larger garden of the school where he taught (since I had found the chestnut there in the first place). 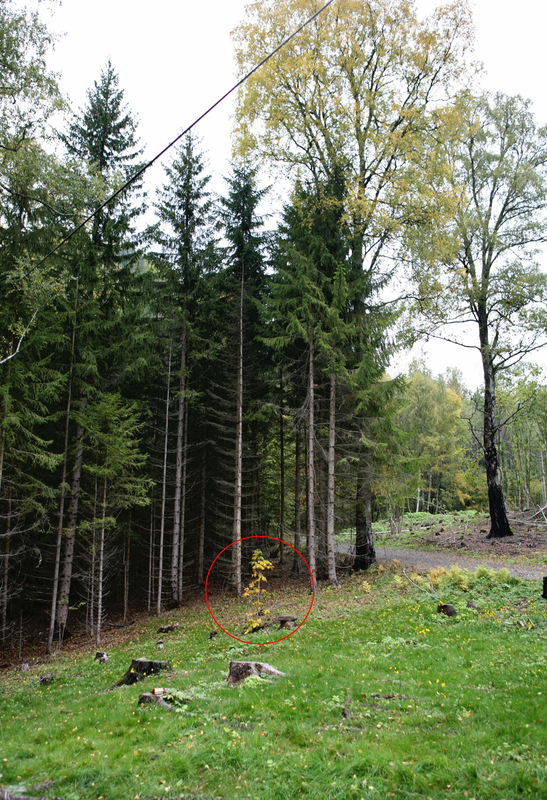 I saw “my tree” from time to time, but nowadays it is no longer there, it has been cut down along with other trees. Here in Halifax I am surprised that not only is the weather still generally balmy (except on rainy and windy days, which have been rare) but very few trees have lost their leaves, or even begun changing colour. Usually October is the prime season for tourists to come and “view” the fall foliage, especially the spectabular red maples. Apparently scholia to Nicander introduce the Pontus alternative. Liddell & Scott only cite EM, which goes with Thessaly. Mr Crown, I see that your fall leaves are yellow (with a bit of orange), not red. Same thing in Moscow — even the maples just turn yellow. Can anyone explain why trees only turn yellow and not bright orange or red? “Can anyone explain why trees only turn yellow and not bright orange or red?” Isn’t it to do with sugar? So Russian maples have less sugar? Or Moscow autumn doesn’t have the right balance of sunny days and cool nights? Is Wabe cognate with “web”? Duden says yes. A honeycomb is a beesweb [Bienenwabe]. mab. we seem to have the yellow maples (as in the top picture here) and the red maples (as in the other post, a couple of weeks ago). I don’t see why they turn at all. There’s no frost, I think it’s all a matter of willpower. Stu, thank you. I like beesweb, it goes well with tree potatoes. Tree leaves turn colour when they start going into dormancy and the chlorophyll stops being produced (or retreats from the tree’s extremities, I forget which), revealing the underlying colour which is normally masked by the green chlorophyll. But there must be something else to it: I was told that the most brilliantly red of the sugar maples are the trees which are most exposed to the weather, growing singly or on the edge of a forest. Actually, it is not just the sugar maples that have red leaves, some other maple species do too, just not all of them. Dearieme: We are anxiously waiting for our one Cox’s fruit to be ripe enough to pick – we are leaving late next week and would hate to miss them. However, our Bramley cookers are in full spate and we are having excellent apple puree. I got twenty-four Bramleys this year from our two tiny trees — they’re more like twigs really. I think I planted them three years ago. I wish I had a couple of Cox’s too. I wonder if they have them in Sweden? I remember they sell the apples in Germany. Cox Orange are my favourite apples. You can’t get them in most stores here, but I buy them at the farmers’ market from a grower who sells about a dozen varieties of apples. Canada, huh. Thank goodness for farmers’ markets. For the last several decades at least, back-to-Nature Germans have been working methodically – unsung in the media until recently, is my impression – to restore the former variety of things like apples and tomatoes. In reports shown on regional TV programs, I have seen dozens of types of apple that didn’t look like apples at all, and over a hundred (I think) types of tomato ditto. Examples of such regional programs are “WDR Bonn”, “WDR Düsseldorf”, “WDR Aachen”, where WDR is the Westdeustscher Rundfunk. They braodcast usually in the evening from 19:00 to 19:45, for instance. I haven’t seen such resurrected varieties yet in Cologne, not even at the eco markets. Usually the apples are just your standard Elstar, Cox Orange, Braeburn and Granny Smith (from Chile) etc. Tomatoes are just plain or “fleshy” types (from Belgium), or Italian pear tomatoes. Germans are interested in apples, that’s good. And cheese, also good. I remember a friend of mine complaining about Dutch irradiated tomatoes when I lived in Germany. We have very good tomatoes these days; quite expensive, but lots of flavour. Stu, you mustn’t be so blasé about your Cox’s. I’m planning a trip across the Swedish border to buy some. I do hope they sell them. Ha! Not only do they sell them, they call them Äpplenas Rolls-Royce. They look very good. Another sort for me lust after and not be able to buy — and gris means “pig” in Norwegian. That’s interesting. I had read somewhere or other that while England was cultivating apple varieties in the 19th century, France was doing the same with pears, and didn’t produce any notable apples (nor England pears). I don’t think I’ve tried French apples.